Chef Nobuyuki Matsuhisa, the maestro of Japanese fusion cooking, exists on one-name celebritydom: Nobu. With more than 40 restaurants and hotel properties worldwide (a partnership with Robert De Niro), Matsuhisa may be the most recognizable Japanese chef in the world. There’s no finer and indulgent preparation of cooked fish in the world than Nobu’s sweeter version. 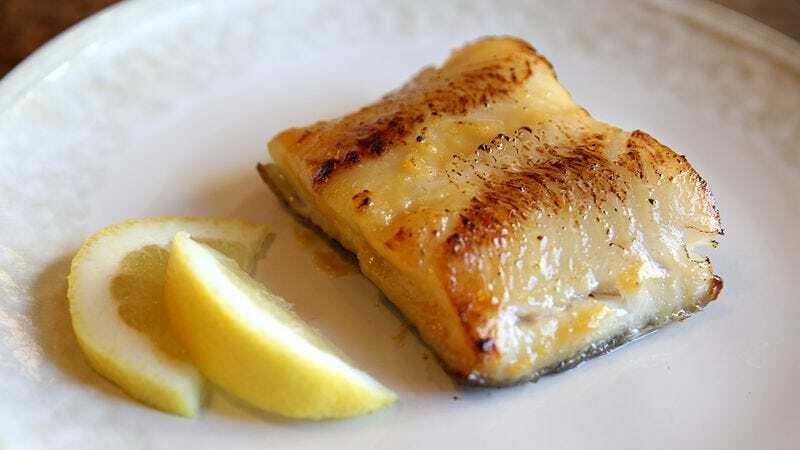 Black cod, a white-fleshed fish that tastes as if its diet consisted solely of fresh butter, gets marinated in a sweet and savory miso marinade, then broiled until its surface caramelizes and crisps. Because Nobu’s black cod first saw light at its flagship Beverly Hills restaurant, the dish was priced accordingly—it costs $36 today for a single fillet. Yes, the market price for black cod is expensive, but the sticker price belies the low effort required to prepare the dish. Other than a stove top and a saucepan, you only need five ingredients, a bowl, a Ziploc bag, and a toaster oven to replicate a dish at home that tastes like it was cooked in a four-star restaurant. To prove this, I cooked this dish in our office toaster oven. The night before, I prepared the marinade on my stove top, which took all of five minutes to mix. The time spent in the broiler was under 15 minutes. Which means that if you take away the overnight marination, the total active time is shorter than 20 minutes. Here are the opinions of my colleagues (I asked them to be honest and unsparing): “Incredibly flavorful, especially for having so few ingredients”; “outrageously flavorful, with a delicate sweetness and perfect flake”; “I would’ve eaten it by the handful if other people weren’t around.” This dish fits squarely into the category of genius recipes (like Jim Lahey’s no-knead bread and Marcella Hazan’s tomato butter sauce) that yield a remarkable wow-to-simplicity ratio. The root of this recipe comes via Masaharu Morimoto (himself the former executive chef at Nobu’s restaurant) and his practical new cookbook Mastering The Art Of Japanese Home Cooking. A note about sourcing: Black cod (or sablefish) is not the easiest fish to find. A fish similar in texture and flavor (and market price) is Chilean sea bass, but that’ll cost you about $15 for a half-pound, single-serving fillet. I opt for salmon—not sockeye, not Copper River, but the fattiest piece of Atlantic salmon I can find. If your neighborhood fishmonger would part with the salmon belly, tip them nicely. As for the marinade ingredients, you can find white miso (it’s actually a blond color), sake, and mirin (sweet rice wine) at Whole Foods or the international aisle of finer grocers. 1. To make the marinade, set up a double boiler: Fill a saucepan with an inch of water. Find a large, heat-safe mixing bowl that’ll rest over the rim of the saucepan without touching the water. Turn your stove on to a medium setting. Combine the miso paste, sugar, sake, and mirin, and whisk for about three minutes. Don’t allow the sauce to bubble, but get it hot enough to melt the sugar. To test whether it’s done or not, take the back of a spoon and drag it along the side of the bowl. If it feels gritty, it means the sugar hasn’t melted yet. The consistency should be that of paste, not liquid. Place this bowl in the fridge for five minutes and allow it to cool. 2. Place your fish in a Ziploc bag. Generously spoon the marinade onto the flesh side of the fish, saving some for the skin side as well. Press the air from the bag, and let it sit in the refrigerator overnight. The fish can also be marinated the morning of the day it’ll be eaten, but ideally it should be marinaded for at least 18 hours. 3. Turn on your toaster oven’s broiler function—it should be past 500 degrees (of course, you can cook this in a standard oven as well). Line a baking sheet with aluminum foil and lightly oil it. Place the fish skin-side up on the sheet, then broil this on the top rack for about six minutes or until the skin becomes crisp and charred. Flip the fish over so it’s now flesh-side up, and broil this for another six minutes if it’s salmon, or eight minutes if it’s a white-fleshed fish. (The timing will also depend on the thickness of the fish. I don’t mind the salmon a bit underdone, but I like my black cod or Chilean sea bass to be flaky and opaque in the middle. Either way, you’ll want the surface of the fillets to become bubbly and charred.) Serve immediately, with a wedge of lemon if desired.